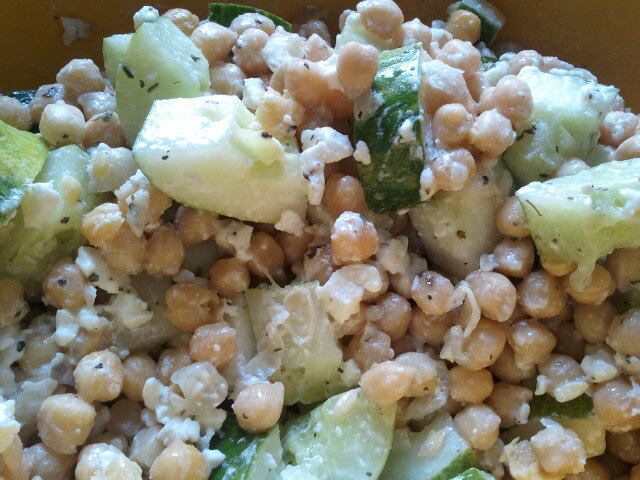 My boss recently gave me some awesome cucumbers from her summer garden, and a chickpea salad was the perfect way to eat them! Creamy, delicious and protein-filled, this is one of my new favorites! Soak the chickpeas in water for at least two hours. Boil them for another hour or so, until almost squishy. Run cold water over the cooked chickpeas and place in a large bowl. Chop the cucumber in small dices. Add the feta, cucumber, Italian dressing and toss together. Enjoy at any time of day!